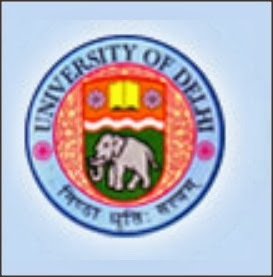 Applications are invited by University of Delhi (DU), Delhi for admission to Doctor of Medicine (MD) program in Practice of Medicine (2 seats) and Organon of Medicine and Homoeopathic Philosophy (2 seats) for unreserved category offered at Faculty of Homoeopathic Medicines for the academic year 2014-16. (i)The candidate must have passed the degree of Bach elor of Homoeopathic Medicine & Surgery (BHMS) from the University of Delhi, or from any other University established by law and recognized by Central Council of Homoeopathic in cluded in the Second Schedule to the Act, after undergoing a course of study of not less than five years and six months duration including one year compulsory internship which must be completed by 31 st July, 2013 and should have obta ined permanent registration from the Board of Homoeopathic System of Medicine. (ii) Bachelor of Homoeopathic Medicine and Surgery (Graded Degree) or equivalent qualification in Homoeopathy included in the Second Schedule to the Act, after undergoing a course of study of not less than two years duration. Eligibility Criteria for DU Delhi: The candidate must have passed the degree of bachelor of Homoeopathic Medicine & Surgery (BHMS) from the University of Delhi, or from any other university. Candidates holding bachelor of Homoeopathic Medicine and Surgery (graded degree) or equivalent qualification in Homoeopathy included in the second schedule to the Act, after undergoing a course of study of not less than two years duration. The application form can be downloaded from official websites. Candidates must submit the same duly filled in and complete in all respects with requisites demand draft, to the office of the Deputy Registrar, Faculty of Homoeopathic Medicine, 6th Floor, V.P. Chest Institute Building, University of Delhi, Delhi-110007 on or before 31st October, 2013. Selection Procedure for DU Delhi: The selection of candidates is done based on the Post-graduate Degree Courses in Homoeopathic Medicine (PGMET-H) entrance test conducted by the university at Delhi only. Important Dates: Last date for submission of application form: Thursday, October 31, 2013. Date of entrance test: Saturday, November 16, 2013.